La cancelación de la reserva se debe hacer dentro de los 7 días antes de la llegada, de no ser asi se cobrara un dia de reserva. 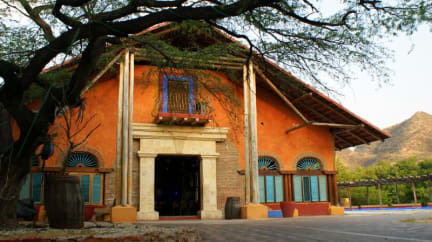 The Escollera's architecture was and design in the construction was inspired by the church of the movie The Mission, which was filmed in the area of ​​the Don Diego River (park Tayrona) starring Robert De Niro in 1.985. The Escollera has a bar specialised in serving cocktails and beers of all kinds. We offer activities such, ecological walks to virgin beaches and canoe trips by the lake. You can walk to the beach of Rodadero, which is located 4 blocks from the establishment. Our hostel is located in the sector of Rodadero, on an island within a natural lake of salt water; we are four blocks away from the main beach; Within our area(El Ziruma) there are three virgin beaches to which you can walk through the hills. We have shopping centres, restaurants and supermarkets very close to which you can walk. 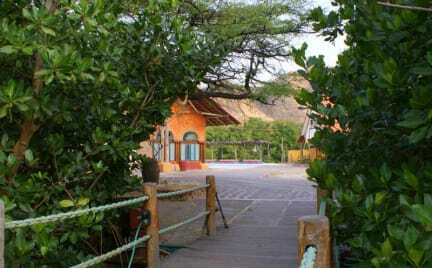 The historic centre of Santa Marta is only 7 kilometres away have dogs, cats and horses. The shared room service was designed for full comfort; the room has two wonderful views; one to the lake and mangroves, and the other from a balcony you see the main hall. We have a main room for a minimum capacity of two people and maximum for four people; it overlooks the lake and measures 40 square meters; it has air conditioning, cable TV and private bathroom. The other private room has also for four people and has air conditioning, cable TV and private bathroom; the standard family rooms have space for 5 people and has air conditioning, cable TV and private bathroom. shares room have space 8 double bunk beds or is for 16 people; It measures 70 square meters and has 8 ceiling fans, and one locker for each guest; it has a shower area and shared bathrooms. Great new hostel. It's clean, the owner and staff are super nice and helpful and the scenery is beautiful. It is not in main Santa Marta, but in Rodadero, which means a beautiful beach is only a 5-minute walk away. The 16-bed dorm is very spacious and is kept perfectly cool at night with 8 large fans on the ceiling. Because they only opened recently, there were very few people when I stayed. It was the calmest atmosphere I have ever seen in a hostel. I think it has amazing potential though.